Photo by studiovd.gr, Nikos Vavdinoudis & Christos Dimitriou. 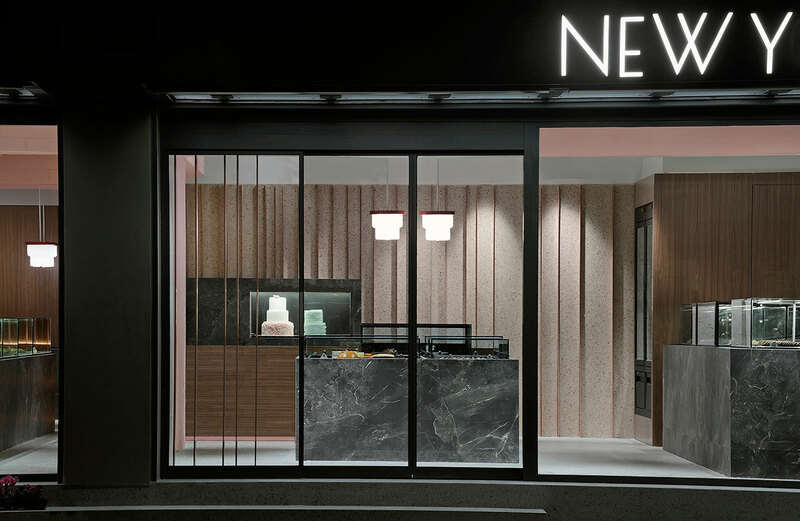 The "City That Never Sleeps" plays the starring role in the complete rebranding of the pastry chain, New York Sweets, by the team of Minas Kosmidis [Architecture in Concept] and is ideally exemplified in the renovation of the family company's flagship shop in Nicosia, Cyprus. 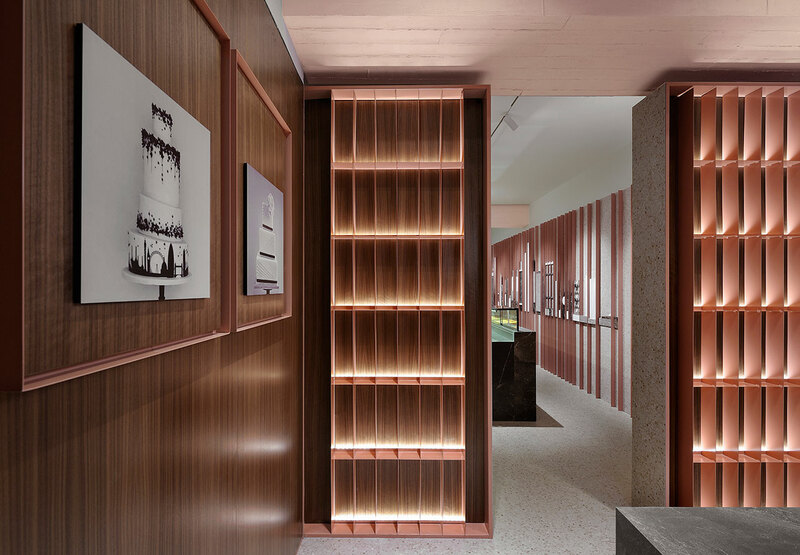 The corner shop's 120 square meters have received a facelift in the image of the brand's eponymous city muse and boast architectural and aesthetic interventions paying homage to it. This is the first of the company's seven stores to feature this redo, with plans for the rest to follow suit soon. 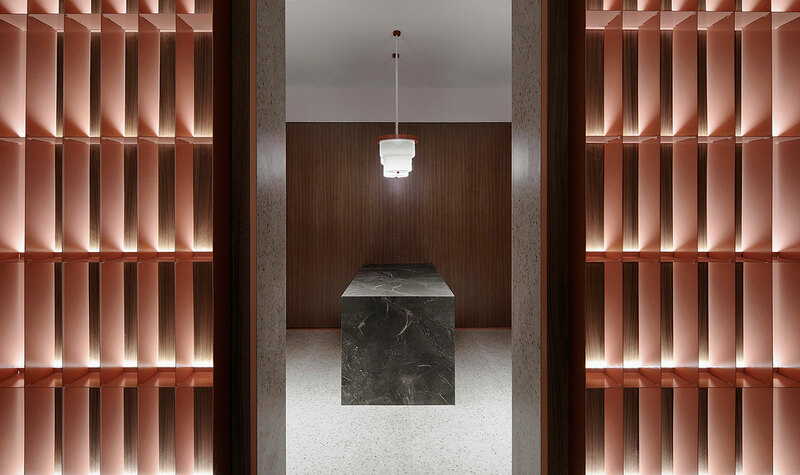 Having been completed in February 2017, the pared-back, urban influences are apparent from the curbside as the shop's façade features a metal "grid" which, in conjunction with the lighting scheme, is meant to reference the entrance canopies of NYC's grand, landmark buildings. 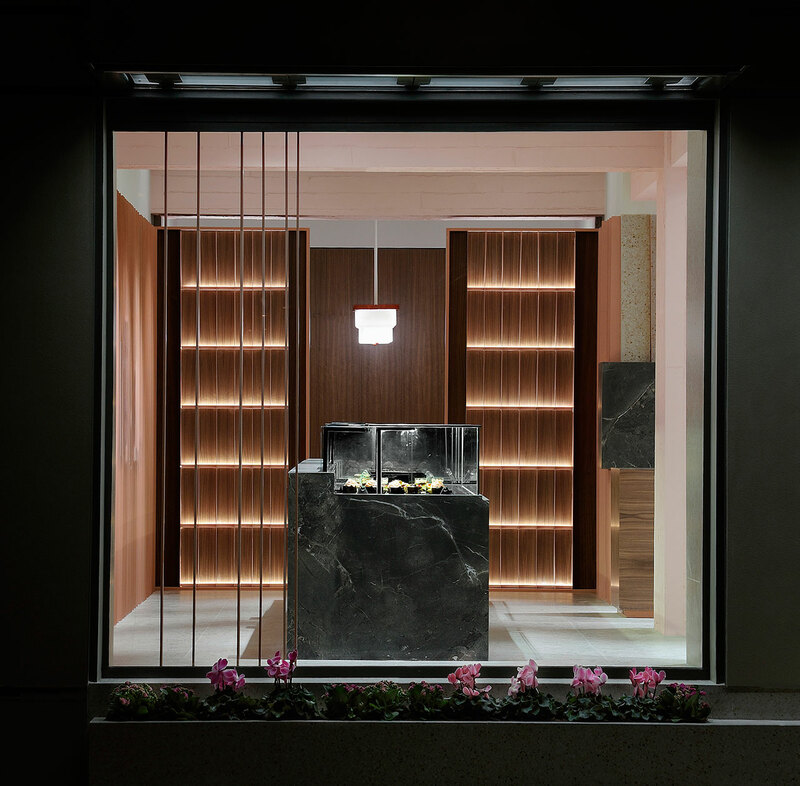 Upon entering, one intrinsically realizes that the city's grid-like layout has found its way inside. 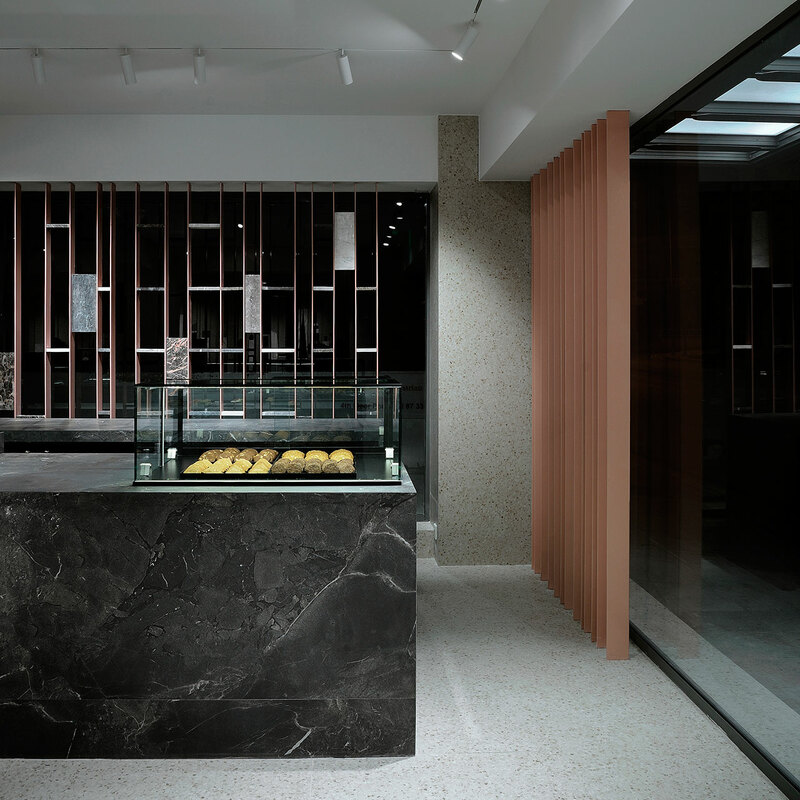 The rectangular floorplan has been thusly divided into a small square on the one side and a larger, rectangular space on the other; the latter has been reconfigured to house the shop's new programme - namely a coffee shop and a semi-private meeting room for clients - alongside the myriad of glass-topped, black marble display cases (which are also refrigerators) filled with delectable, American-inspired sweets. These are displayed with a reverence usually reserved for fine jewelry but with a tongue-in-cheek adherence to the concept inspiration: when viewed from above their display reminds of an aerial view of Manhattan! 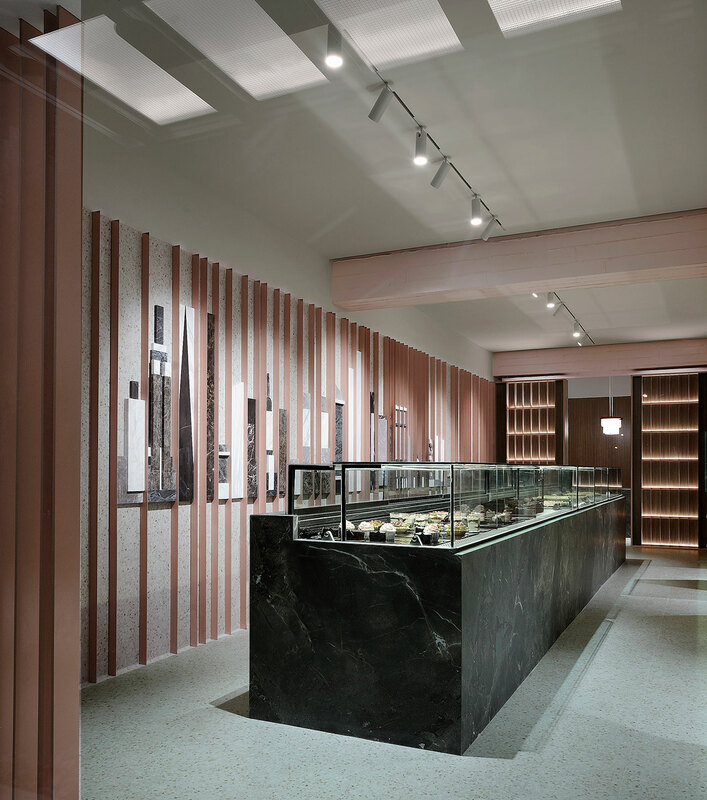 The walls all around the shop continue to feature the horizontal and vertical "grid" of the façade against a white marble mosaic backsplash in soft beige, brown and pale Bordeaux colors, while other elements such as the register case are in a rich, walnut wood veneer. 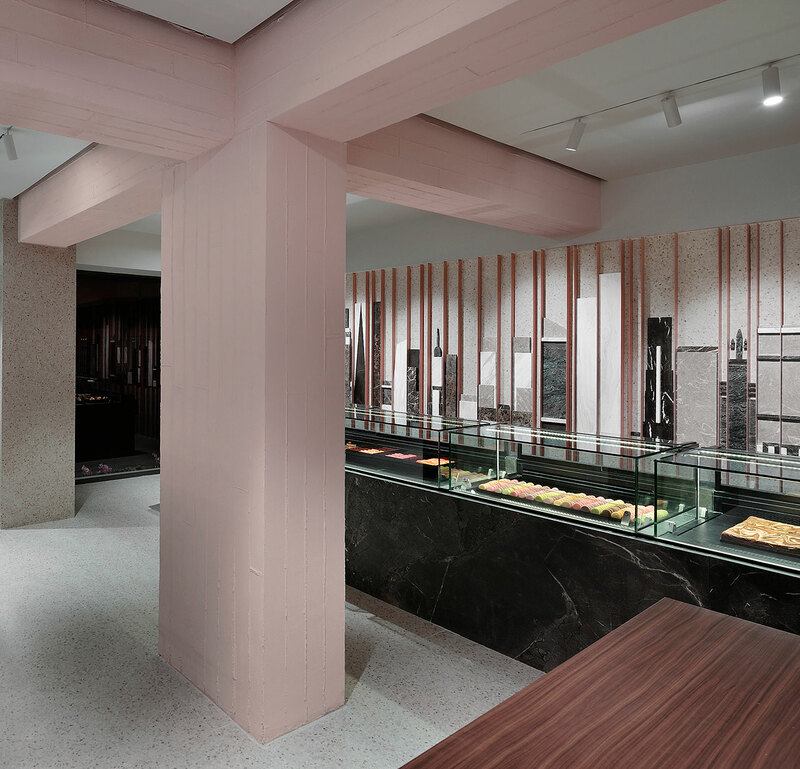 Meanwhile, the shop's structural, freestanding columns and their ceiling support beams are painted a pale pink - used to reference the color and texture of the pastry-making staple, whipped cream. 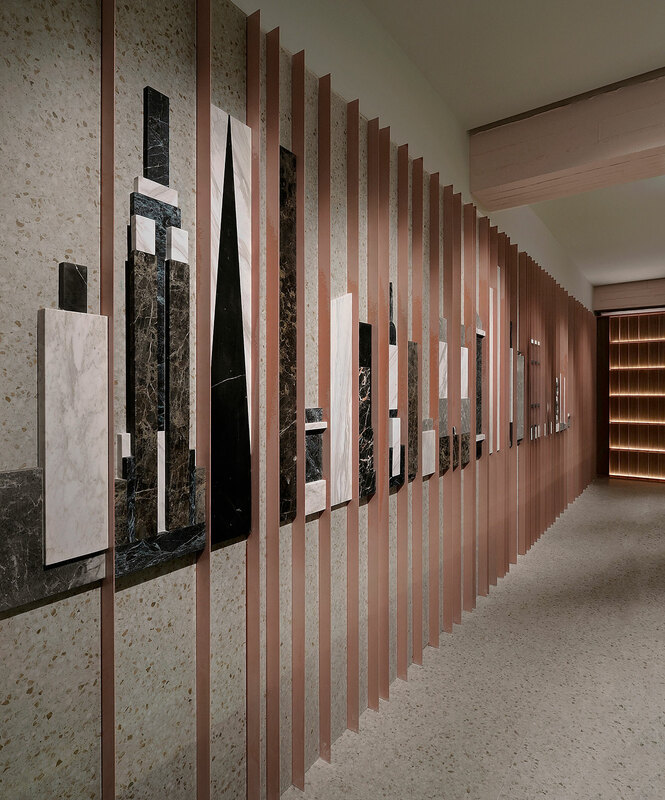 Unequivocally, the highlight of the décor is the sculptural, marble mural of Manhattan's famous skyline which takes up the entire length of the long wall behind the largest display case. 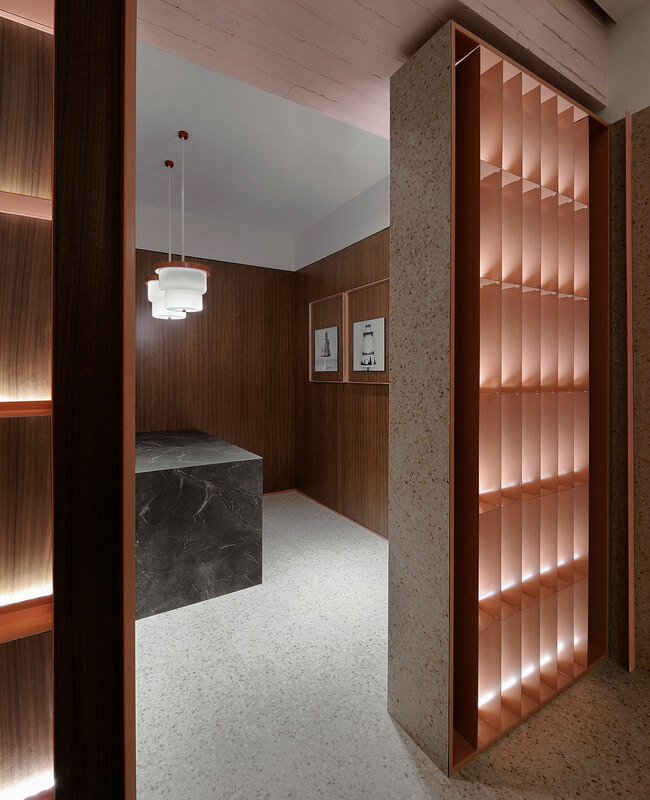 Inventively, the designers have even gone so far as to use Manhattan's grid-like street pattern as the inspiration for the layout of all the freestanding display refrigerators found throughout the shop – as well as delineation points for the meeting room. 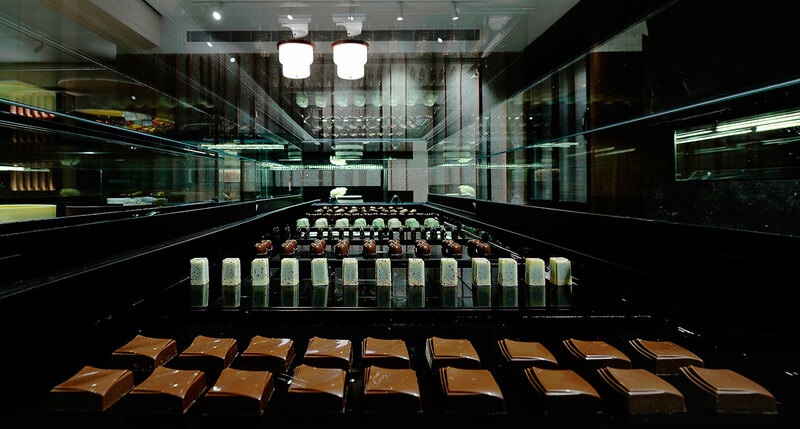 In here, behind a grid-like shelving unit used to display champagne, fine wines, etc. 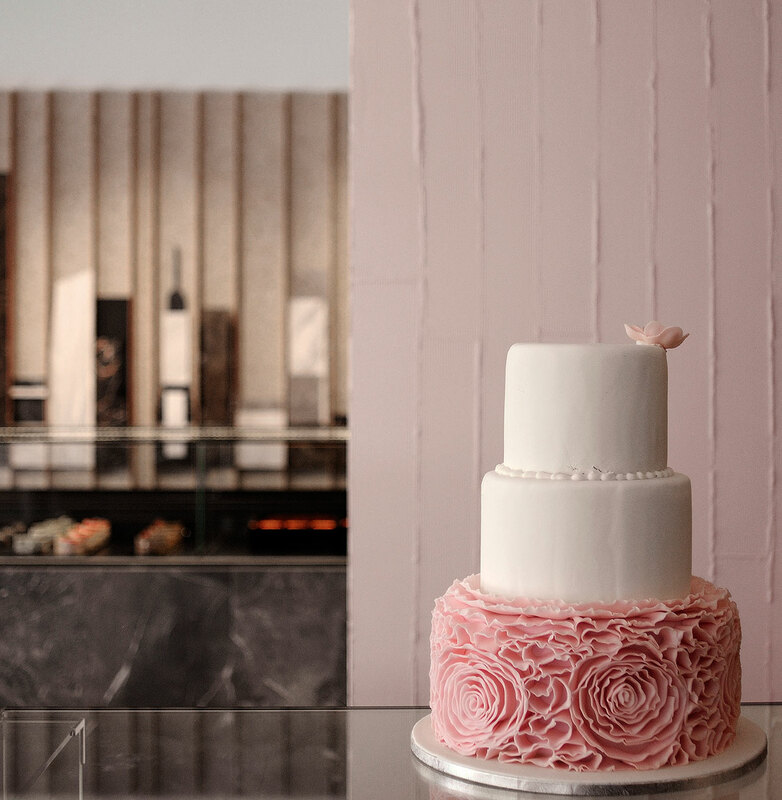 the designers have created a "gallery" wherein photographs of cakes, pastries, etc. have been treated as framed art, both tempting and delighting clients to not only experience the rebranding of New York Sweets visually… but to take a taste as well!